NOTE: Datagraph-med automatically creates a backup copy of your data file each time you shut down Datagraph-med. Besides this Datagraph-med creates weekly backup files in a sub folder of the location of your data file. So making additional backups is just an optional measure against loss of data. 'Backup' will open the file selection box allowing you to backup your entire data file. 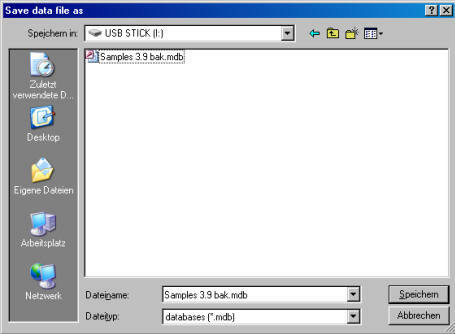 Any media such as an USB Memory Stick can be used. Hint: give it a meaningful name which includes the content and date of last entry!